Tailsman: A pendant which holds a small orb with a dragon wrapped around it. His other symbol is a tatoo of a set of two dragon wings, back to back. 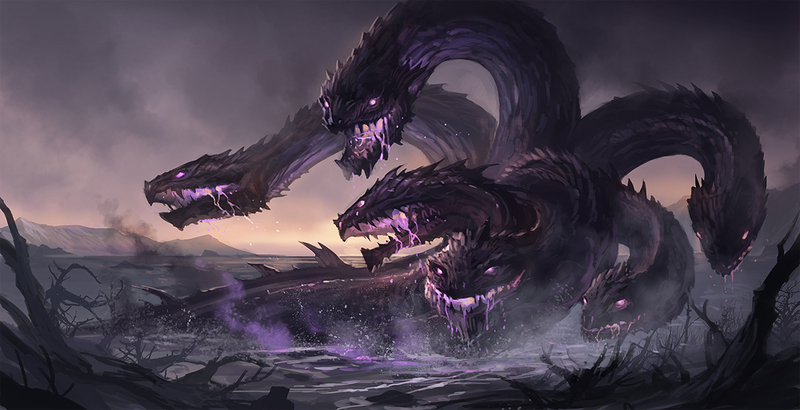 History:Kaigonrya's birth was a magnificent ordeal, he was the first of his kind to be born, the extremely rare hydra! He was praised by all in his village, until, one abominal day, a young boy found a small golden egg. This egg was said to have been born at the EXACT same moment as Kaigonrya, and this egg later hatched and became a golden dragon. This new creature had brought happiness to everyone who had seen it's birth, and so, leaving Kaigonrya to help himself, they took great care of this new baby dragon. The once famous hydra was now but a mere memory. Kaigonrya was ultimately enraged by this..... excuse of a dragon. He waited for months, planning... something. At this time, he was about the size of a human. He had decided to find this dragon... and devour it! After another week of thought, Kaigonrya had decided that it was time to take action. He snuck to the baby dragons temple, which was heavily, heavily guarded. He used his bottom temtecles to crawl, no, more along the lines of slide, up the wall. Once on top, he escaped glances with many guards that were patrolling. Eventually, the hydra reached it's prey, who was sleeping, about the size of a milk carton, and his golden scales glittering in the sunlight. The hydra grinned, and attacked it's prey, however, his attacks were nothing, they easily bounced off a small golden bubble surrounding the dragon. It attacked ferociously, but could not land a single hit. After hours of trying, Kaigonryu gave up hope, and left his rotten village. However, upon his leaving, he heard of other dragons being born, becoming rare enough. Kaigonryu finally had an accomplishible goal, to kill dragons! He set out into the world, aiming to kill as many as possible, and to absorb their power. After years and years of killing, defending and attacking, Kaigonryu had absorbed enough power to name himself the "King of Dragons". Following this, he finally found a way to extract revenge on the pathetic golden rat, he decided to use his gathered power to give the baby dragon.... immortality!!! Making it forever the size of a carton of milk. The hydra left, however, since using his power on the baby dragon, he had become weak again, and, upon using this power, he was granted the dragons true name, Auruli! 1. 500 - Summon Dragoon:Summon a minature version of Kaigonrya to fight alongside you, deals Dark and Light damage for 2 posts. Cooldown is for 5 posts. 3. 2500 - Petra: Summons a dog size dragon for 3 posts, it can fly and breath fire, but dies after 2 hits. Cooldown is 7 posts. 4. 5000 - Dragniws: Makes a pair of dragon wings appear on the users back, summons a mini Kaigonrya and allows the user to breath fire for 4 turns. Cooldown is a topic.